Japanese ceramic tea pots are renowned for their fine craftsmanship. The rich, dark color of this tea pot is beautifully offset against the design of sakura (cherry blossoms), on both the pot and the lid. Japanese ceramic tea pots are renowned for their fine craftsmanship. The rich, dark color of this tea pot is beautifully offset against the design of sakura (cherry blossoms), on both the pot and the lid. 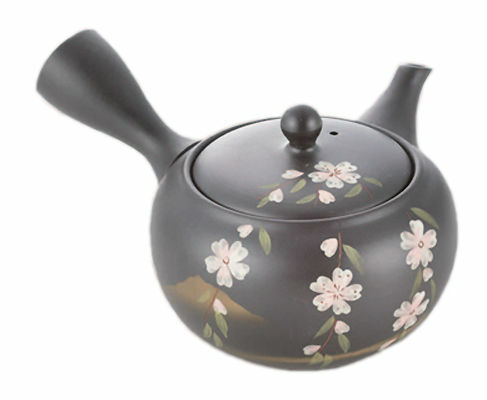 This tea pot is of very high quality and is extremely light to hold and easy to pour. Sakura blooms dramatically across Japan for a couple of weeks every spring, and is of course one of the most famous symbols of Japan. The pot comes carefully packaged in an inscribed wooden box.